The first adaptation of a PERCY JACKSON novel was inauspiciously released in January, performed decently but unspectacularly at the box office and was met with critical indifference; a typical sort of second-tier blockbuster that you wouldn’t really expect to generate sequels. Well, somewhat surprisingly, it has (in fairness, it deserves it more than the awful and decidedly sequelless ERAGON or THE GOLDEN COMPASS films) in the form of SEA OF MONSTERS, and it’s even been upgraded to a summer release (the modest box office and indifferent reviews seem to have stuck, though). Out with the first film’s director Chris Columbus went the first film’s composer, comedy veteran CHRISTOPHE BECK, whose robust fantasy score still towers above anything else in his career in terms of orchestral scope and ambition. Ordinarily, the “composer rotating door” effect is a lamentable phenomenon considering how it prevents a franchise’s music from retaining any form of continuity, and has recently plagued the X-MEN and HARRY POTTER series, not to mention the Marvel superhero films. In this case, however, new director Thor Freudenthal (with a name like that, it seems he’s making a movie about the wrong set of myths) had a pleasant surprise in store to replace BECK: up-and-coming Canadian composer ANDREW LOCKINGTON, whose highly impressive track record in the children’s adventure-fantasy arena made him an ideal choice for this assignment. And once again, he provides everything you would expect to hear in the score to a film like this: a large-scale orchestral and choral foundation, a solid thematic base and plenty of dynamic action cues to drive the pace along. 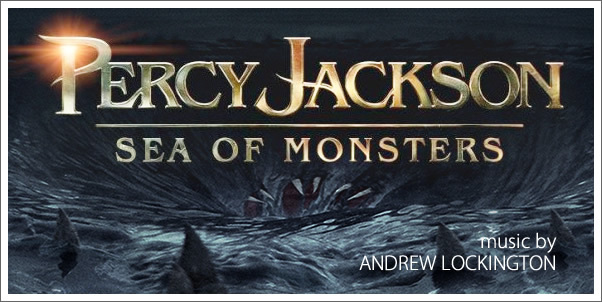 As was the case with his previous score, the fantastic JOURNEY 2: THE MYSTERIOUS ISLAND, the greatest strength in SEA OF MONSTERS is LOCKINGTON’s ability to conjure several themes and juggle them deftly throughout the entire score. The themes for SEA OF MONSTERS aren’t as instantly memorable or clearly delineated as those for the JOURNEY franchise (or indeed CITY OF EMBER), but there is certainly no decrease in the intelligence and depth of their application and manipulation, and the score proves to be a rewarding one upon repeat listens.